Blazing Hot Wok: Weekend Wokking Round-up is Here! 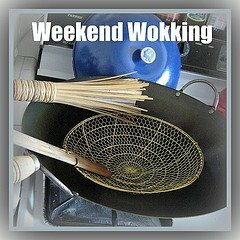 Weekend Wokking Round-up is Here! Tomato Bread Salad submitted by Where's the Bubbler? (I love the story behind the name!) from Southern California. Fresh tomatoes tossed with herbs, red onion, ciabatta cubes and a lemon dressing. Along with Caprese salad, this has to be one of the best ways to enjoy tomatoes at their peak! Tomato and Cheese Bake submitted by Heart and Hearth. Melted cheese atop a delicious tomato? And they're perfect with cocktails? Yes please! 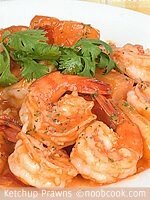 Ketchup Prawns submitted by NoobCook. A dish that combines one of my favorite condiments with one of my favorite proteins?! In a stir-fry? I will definitely be trying this one soon! 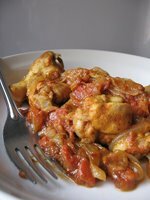 Chicken Tomato Curry submitted by Tigerfish of teczcape-an escape to food. The combination of curry powder, sweet onions and tomatoes give this dish the perfect flavor combination--spicy and tangy. Insalata Caprese submitted by Manggy of No Special Effects from the Philippines. What a wonderfully simple yet elegant dish. This is the way everyone wants to eat tomatoes when they are in season. Vietnamese Stuffed Tomatoes submitted by Wandering Chopsticks from Southern California. 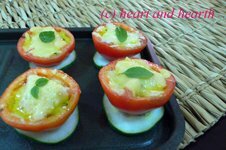 What a delicious twist on stuffed tomatoes! I can almost taste the savory stuffing contrasting beautifully with the sweetness of the tomato. And a beautiful presentation leaving the stems on! 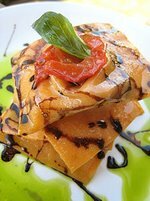 Ravioli "Caprese" submitted by sisters TS and JS of [eatingclub] vancouver from Vancouver, Canada. Who wouldn't love homemade ravioli stuffed with roasted tomatoes, basil and boccocini topped with balsamic reduction and herb infused oil??? Oh my goodness, this decadent dish could certainly make a girl swoon! Egg and tomato submitted by gaga in the kitchen (I love that name!). In case you weren't aware, fried eggs with tomatoes is a Chinese dish. And I always thought this was a Thai dish because it was a standard in our house too. LOL Served over steamed rice, there's nothing easier and more comforting! Stuffed Tomatoes submitted by Giz of Equal Opportunity Kitchen from Canada. This is the most creative presentation I've encountered for stuffed tomatoes. A fresh tomato stuffed with chicken salad. This is perfect summer fare. Tomato Pork submitted by Palachinka. This dish sounds and looks like my kind of comfort food. 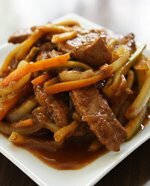 Pork stir-fried with seasonal vegetables in a sauce of douchi (aka fermented black beans), garlic and tomato puree. Sounds perfect served with a bowl of steaming rice. Tomato and Thai Eggplant Stir-fry submitted by Blazing Hot Wok. Fresh tomatoes are always best IMO, but it wouldn't be too hard to convince me to take them in this spicy-sweet yet savory stir-fry! Thanks to all the participants! 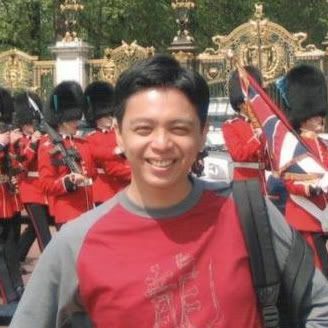 Please remember to link the round-up to your post. I think we're doing so well with the Nightshade family, let's stick with it. First the potato, then the tomato, and now it's EGGPLANT!! I know you all have a special eggplant dish you want to share so get to it! Palachinka is hosting this month. Submissions should be sent to palachinkablog(at)gmail(dot)com by Sunday, August 31. Awesome roundup! 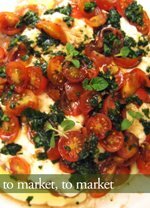 I am liking the dishes you've linked to here-- I hope I can find tomatoes to do them justice! Let's see if I can make something eggplant-y! It's almost time to sleep right now 2338hrs! Can I hug a tomato to bed? Yay! Thanks for hosting, this was a great round-up. What I'm really loving is that even though the dishes are somewhat similar, they always end up completely different. 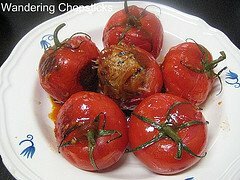 For instance, two stuffed tomato entries and both are so different in presentation and filling. Or two kinds of caprese and we get salad and ravioli. Awesome! Potato, tomato, eggplant! Keep saying it and it sounds like a veggie version of the children's game duck, duck, goose. OK, I think I know what to make for eggplant. It'll be hard though! My eggplant dishes never turn out very pretty. What a great round up! Gosh, where to begin? All these recipes are terrific! Eggs and tomatoes -- works for me! And Manggy's caprese looks terrific as does the Vietnamese Stuffed tomatoes. That curry looks so good and so does the ravioli. All the others look fabulous, too. Every one of them is great. Now if only my tomatoes would turn red! Looking forward to what everyone does with eggplant. Paula, how about you? Why don't you play along and submit something? It's fun! doesn't have to be Asian or made in a wok either. This was great! All the entries are so delicious looking, I can't wait to try them. Thanks to Darlene for all the hard work. Wow, what a totally delicious round up! I can't believe how fast time flew and didn't get a chance to write up a post on tomatoes, the ingredient that we chose! *bad us, spank, spank! * Sorry. We definitely made lots of tomato dishes, but didn't have the time to write it up! But for sure, the eggplant will be on the list and we'll definitely write about it. Great work on the round up! Lars, cut corners! Umph! :-) Don't worry, I have another dish in mind. And why don't you submit something? BTW, I read about your trip to Bremen. I'm so jealous!! Ooh, I saw Mark (Manggy)'s caprese, but the rest are new! Oh no -- eggplant, eh... That's going to be tough for us. Hehe.